From Mycenae, Greece. Height 16". Ceramic. 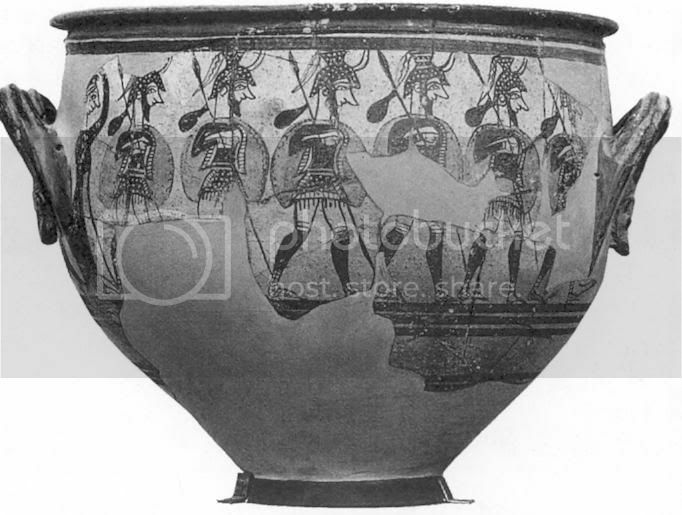 There is a narrative on the vase describing a woman saying goodbye to a group of helmeted men. The only sign of the woman's emotion is her arm raised to her head. From palace at Mycenae Greece. Height 2 3/4". Product of Minoan-Mycenae artistic exchange. Observes natural forms in an intricately interlaced position. Carved entirely in the round. 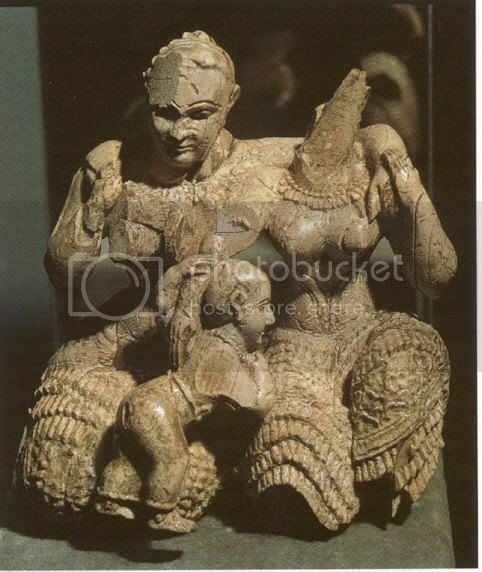 Thought to be a generational statue (possibly grandmother, mother, and child) since there are no symbols as to identifying the subjects, but it could easily be two nymphs caring for a child god. From citadel at Tiryns. The citadel built near coast did not have many natural defenses, this was made up for by the strong defenses built into the citadel itself. The fortress had outer (ring) walls that were 20 feet thick, and the inner walls were massive as well. The casemate here provides space for storing arms and sheltering soldiers or townspeople. 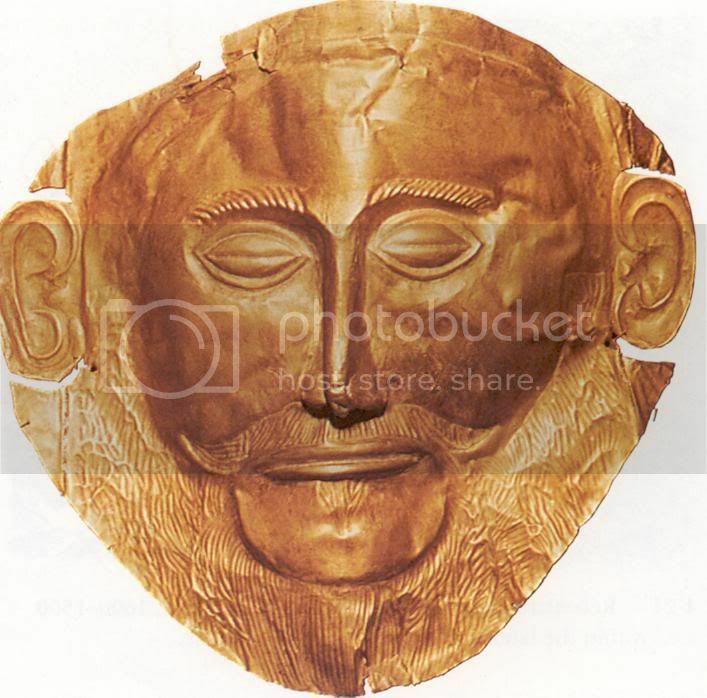 From Mycenae, Greece. 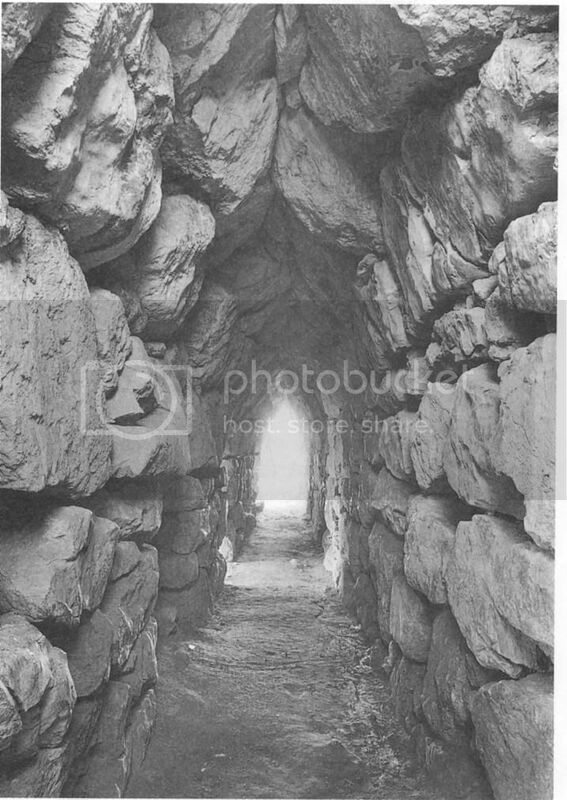 Example of Cyclopean construction because it was thought that only Cyclopes were able to move the massive stones. Walled passageway covering the tomb that led to the entrance was about 20 feet long and 20 feet wide. Original entrance was over 34 feet high and covered with bronze plaques. Height of sculpture 9'6". Limestone relief. 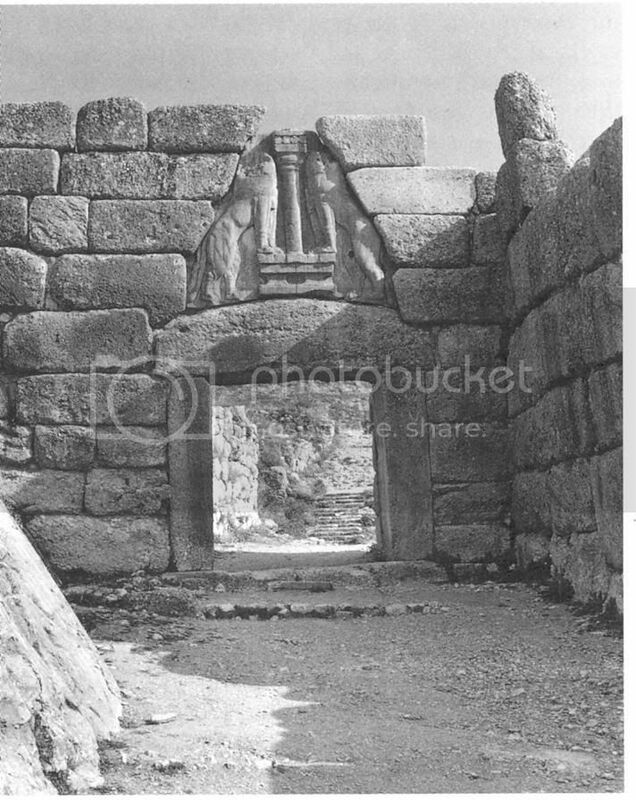 Gateway to citadel at Mycenae. Reminder to cities war-like past. Proposed of megaliths. 2 9'' tall lions guardians in triangle forms. Their heads, now missing, were made separately of stone, wood, bronze, or gold. "Flotilla" Fresco: c . 16050 BCE. From Room 5 of West House in Akrotiri, Thera, Second Palace period. 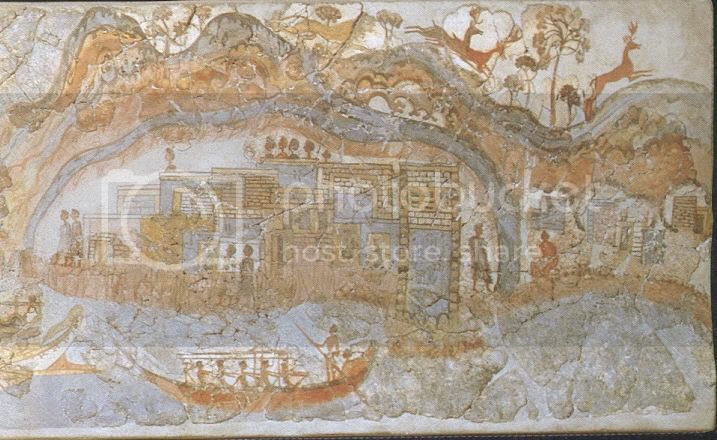 Painting shows the port of Akrotiri with boats, dolphins, boats, and villages. Akrotiri was destroyed 3,500 years ago from a volcano to form the current island Thera (one of the Cycladic Islands in the southern Aegean Sea). Two figures of Women: c. 2500-2200 BCE. From the Cyclades. Made of marble. Height: 13'' and 25''. 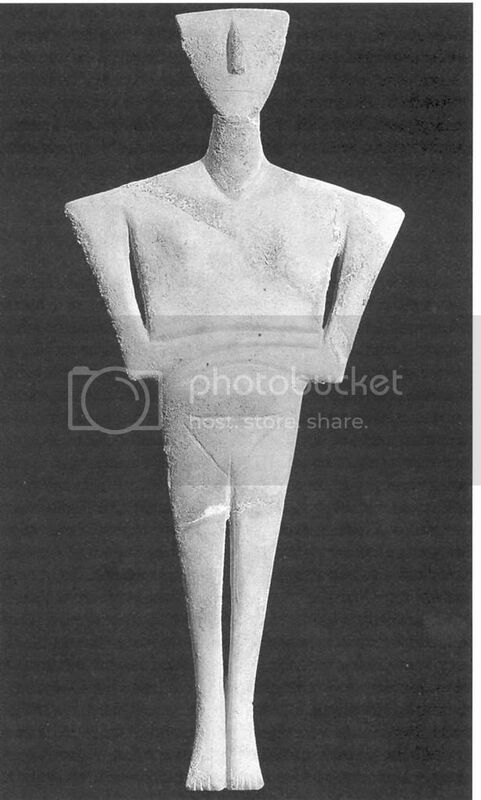 Shows Cycladic art with pared-down, elegant rendering of the figure. They are also not far removed from the marble slabs. Heads are titled back, arms folded, and toes pointed down to show the figures were intended to lie on their backs as if to be asleep or dead. The anatomical detail as also been kept to a minimum. Statues were originally painted facial features hair, and ornaments in black, red, and blue. Possibly a votive figure. Seated Harp Player: 3rd millennium BCE. Fro m Keros, Cyclades. Made of marble. Height 11 1/2''. 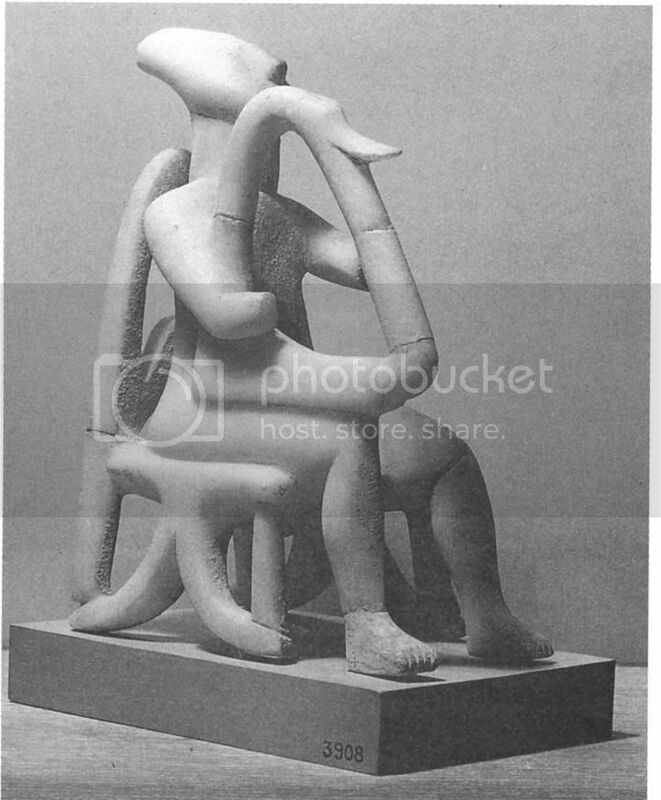 Fully developed sculpture in the round but similarly simplified like the two women figurines. Best characterized as a musician, particularly a harpist: on a chair, head tilted back as if singing, knees and feet apart for stability, arms raised, bracing instrument with one hand and the other plucking. Possibly a votive figure. 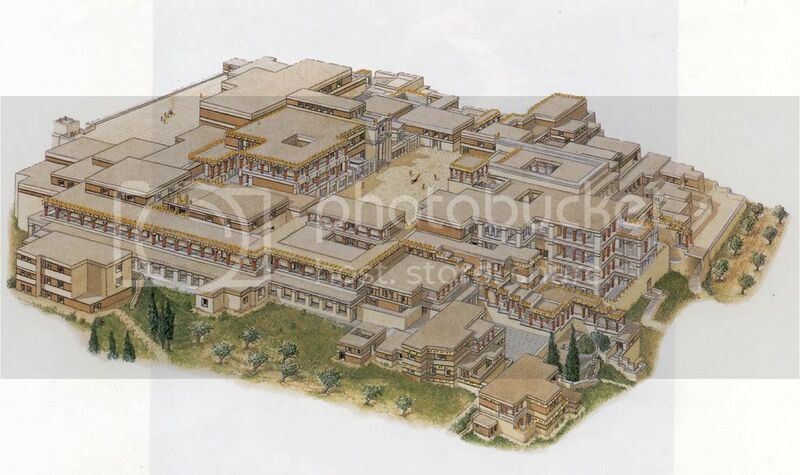 Reconstruction of the palace complex, Knossos: Site occupied 2000-1375 BCE. From Knossos, Crete. Complex begun in Old Palace period (c. 1900-1700 BCE). Complex was rebuilt after earthquakes and fires during Second Palace period (c. 1700-1450 BCE). Final destruction was in c. 1375 BCE. British archaeologist Sir Arthur Evans, discovered this areas of the Minoan civilization. Building structures often focused on special landscape features like the sacred Mount Ida. Complex contained a large central courtyard, granaries, storage pits, theater/performance area, independent rooms with eight or nine suites. 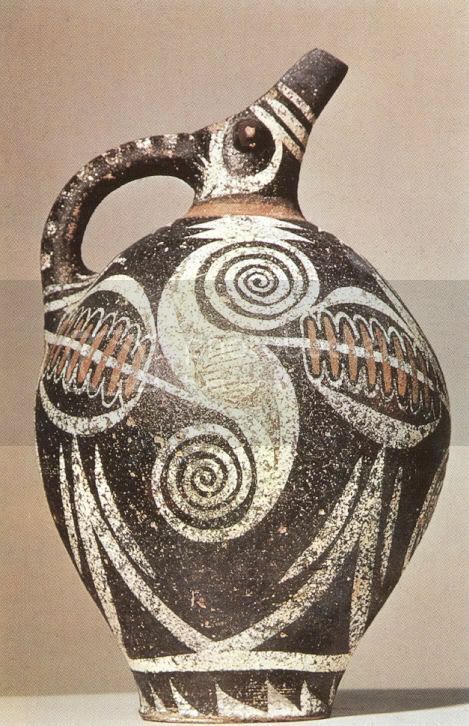 Kamares Ware jug: c. 2000-1900 BCE. From Phaistos. During the Old Palace Period. Made of ceramic. Decorated with brown, red, and creamy white pigments on a black body. Height: 10 5/8. Based on the hallmarks it was thought to be exported as far away as Egypt and Syria. Has a globular body and a "beaked" pouring spout. The jug has rounded contours complemented by bold, curving forms derived from plant life. Court with st aircase reconstructed by Sir Arthur Evans: Leading to the southeast residential quarter, palace complex, Knossos, Crete. 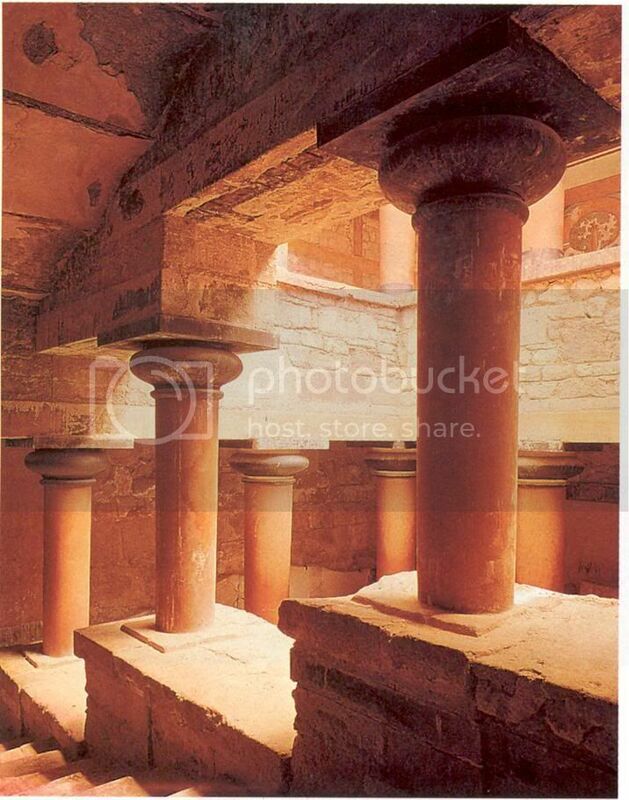 Hall is supported by uniquely Minoan-type wood columns that became standard in Aegean palace architecture. The top of the columns that supported the massive roof beams and a broad flattened capital was wider that the bottom. Was arranged around a central space (rather that along a long axis). 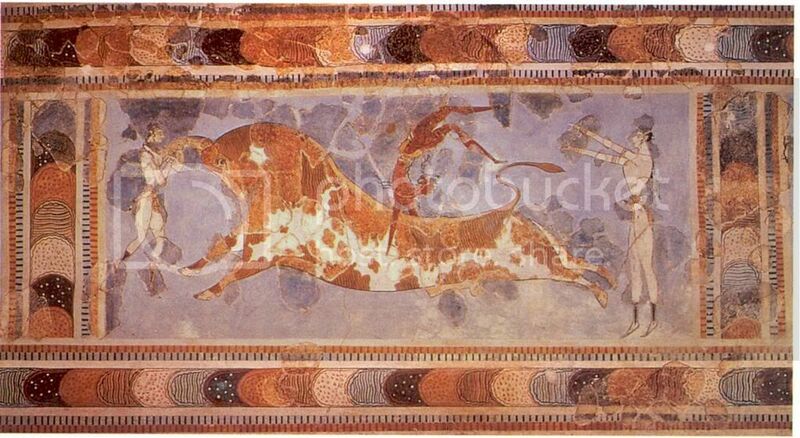 Bull leaping, wall painting with areas of modern reconstruction, from palace complex, Knossos, crete. 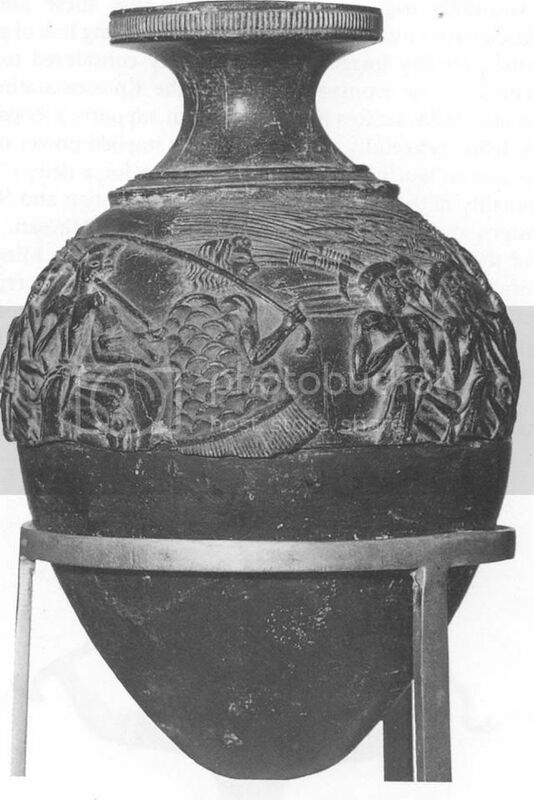 Late Minoan period C 1450 – 1375 BCE, about 24 ½" tall. One of the best preserved paintings. May represent initiation of fertility ritual. Shows 3 youthful people with a large bull in the center. The frame is made of overlapping ovals, chariot-wheel motif in between stripped bands. second palace period, C 1500-1450 BCE> marine style ceramic 11" tall. 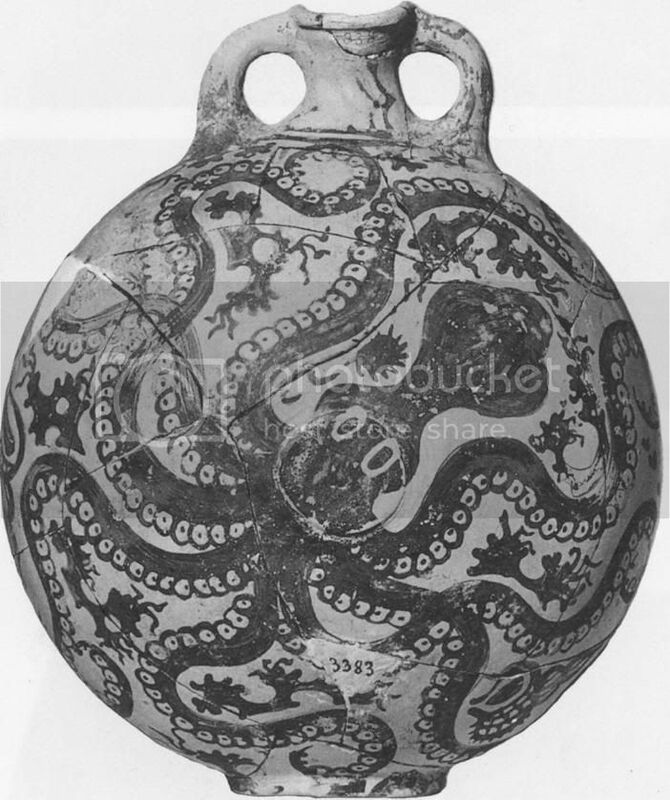 The marine style was when sea life was painted on pottery. Many sea creature surround the octopus, in between his tentacles. Image stylized in harmony with the vessels shape. Second palace period, C1650-1450 BCE, steatie, 4 ½" in diameter egg-shaped rhyton originally covered with gold leaf. Carving of 27 rowdy men. Instead of orderly people. The people show movement and show emotion. They are arranged unevenly. It is interpreted as a fall harvest festival, religious procession, crowd of warriors, or gang of forced laborers. second palace period. C1550-1450 BCE. Steate with shell, rock crystal, red jasper, restored gift wood horns 12" tall. 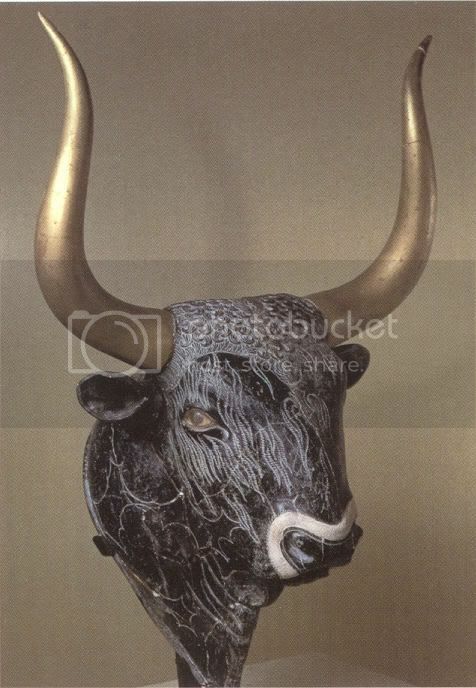 Bulls appear very often in Minoan art. Rhytons were also made in bullform. Bull's horns covered with gold leaf, white shell for nose outline, red jasper for eyes. Used for serving ritual fluid, poured into neck and goes out through the mouth. C. 1650-1450 BCE, gold, 3 ½" tall. 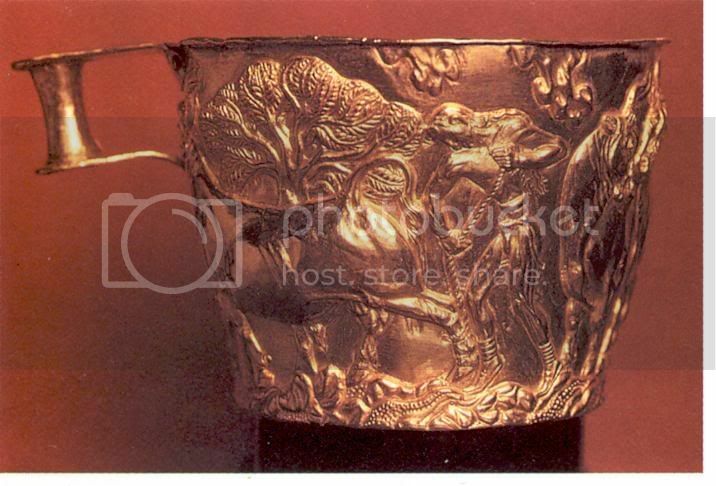 One of 2 gold cups found in a large tomb in Vapheio. Relief done in repoussé, the technique of hammering from the back of the sheet. Handles attached with rivets, lined with a sheet of gold. Depicts different forms of bulls. Maybe sacred scene of a sacred grove. 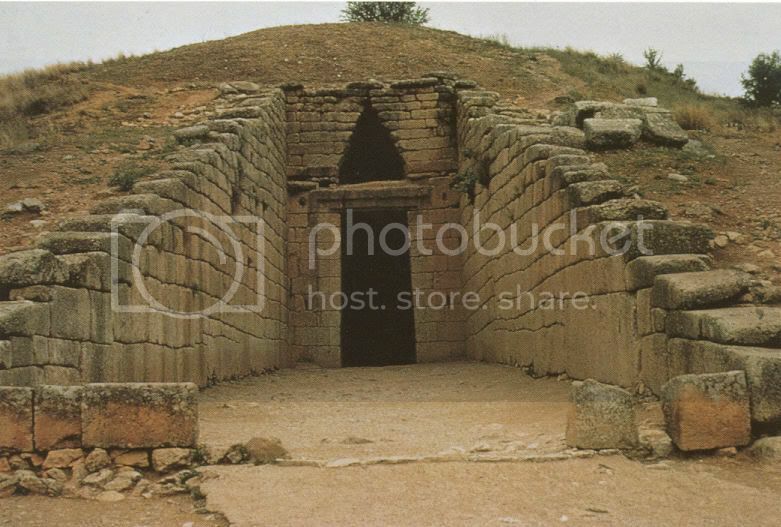 C. 1600 – 1200 BCE, wall built C. 1340, 1250, 1200 BCE. Hilltop position, Lion Gate is in the lower left, near east coast of the Peloponnese peninsula, of the leader of the Greek army that conquered Troy.